Joe Perry has announced a new leg of tour dates in support of his 2018 solo album, Sweetzerland Manifesto. 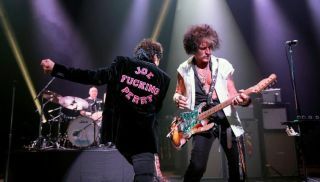 Perry will be joined by a band featuring his Aerosmith co-guitarist Brad Whitford as well as Extreme vocalist Gary Cherone. The shows kick off November 30 in Iowa and include stops in New York, Detroit, Los Angeles and other cities. The full tour itinerary is below, and you can visit JoePerry.com for more details.